A 22-year-old named Ronaiah Tuiasosopo allegedly created the bogus woman. Manti Te’o broke his silence late Friday and denied any involvement in the dead girlfriend hoax that has consumed the former Notre Dame All-American for days, while saying the man behind the ruse called two days ago to apologize for it. A 22-year-old named Ronaiah Tuiasosopo allegedly preyed upon Te’o in creating a bogus woman named Lennay Kekua who began an online- and telephone-only relationship with Te’o, Notre Dame’s bellwether linebacker, only to die in September of leukemia and create a personal back story that propelled Te’o to national renown but ultimately crumbled this week. Schaap reported after a 2 1/2-hour interview with Te’o that the player wasn’t completely sure Kekua did not exist until two days ago — when Tuiasosopo called Te’o to admit he was behind the hoax and apologize for it. 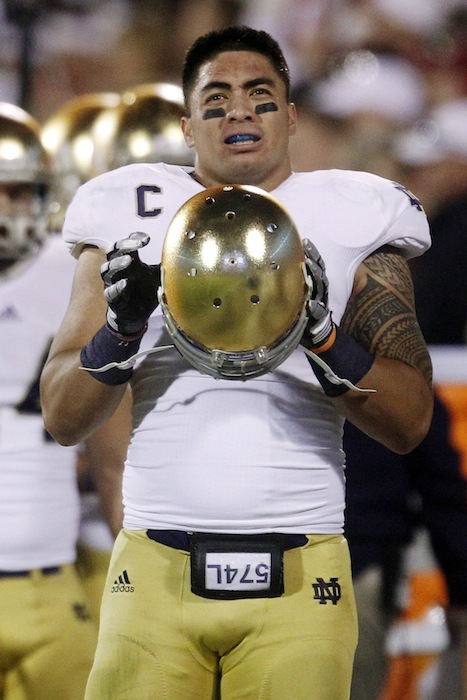 As for at least one glaring inconsistency — the story of how Te’o and Kekua met — the former Irish star admitted to a lie. The relationship, such as it was, began during Te’o’s sophomore year at Notre Dame via Facebook, he told ESPN. He attempted to contact Kekua via Skype and Facetime but never saw a face on the other end, Te’o said. ESPN reported Friday that Tuiasosopo called a friend from church in early December and admitted he duped Te’o, without the Notre Dame linebacker playing a part in the deception. Deadspin.com, which broke the girlfriend hoax story Wednesday, reported that Te’o might have played a role in the fraud. Te’o denied that he used the situation to enhance his Heisman Trophy candidacy. He finished second in the voting to Texas A&M’s Johnny Manziel. Te’o did say the ordeal weighed on him during Notre Dame’s 42-14 loss to Alabama in the BCS title game, in which he played arguably one of the worst games of his career.